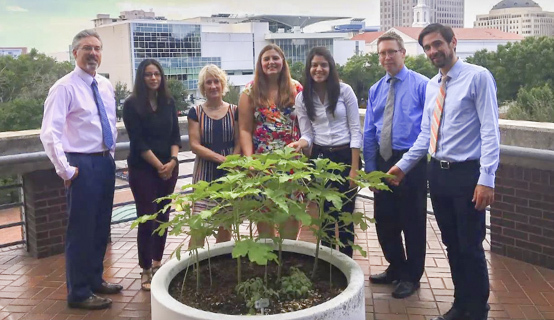 Orange County employees have planted herb and vegetable gardens at the downtown Orange County Government Administration Center to highlight urban gardening and teach sustainable gardening practices. A living example of Orange County’s Sustainable Plan, “Our Home for Life,” the Employee Plant Sustainable Garden has become a focal point at the downtown Orange County Government Administration Center. Several County employees volunteered on a Saturday morning in June to plant herbs and vegetables in large planters on the third-floor veranda to display urban gardening and teach sustainable gardening practices. Each day a different Orange County employee takes a few moments to water the garden as needed. They also snip away unhealthy pieces, inspect for bugs and learn the ropes of sustainable gardening along the way. “We have tried to use organic means of pest control and fertilization, thereby reducing the addition of harmful chemicals into our environment and food sources,” said Lori Forsman, Sustainability Specialist for CEDS. Eggplant, okra, tomatoes, basil, thyme and oregano are just a few of the items available for harvest. Each Friday, employees harvest the herbs and vegetables in packets to share with fellow employees. Sometimes the packets include a recipe so that employees can try something new for dinner. It’s a great way to brighten someone’s day and teach the fundamentals of Orange County’s Sustainability Plan. The garden has generated discussions and has sparked great relationships among the CEDS team and other employees. It has provided a way to share knowledge about gardening and cooking. The hope is that employees throughout the County are inspired to start their own community gardens, backyard gardens or even container gardens at their own workplace. Employees are invited to watch the garden grow and participate in nurturing the plants. To learn more about Orange County’s Sustainability Plan, visit www.ochomeforlife.net.